The Salton Sea is a shallow, saline lake located in the California desert. Both the Salton Sea State Recreation Area and the Sonny Bono Salton Sea National Wildlife Refuge are located on its shores. The Salton Sea occupies the Salton Basin, a remnant of prehistoric Lake Cahuilla. It is bordered on the south by the rich agricultural areas of the Imperial Valley, on the west, by Anza-Borrego Desert State Park and on the north by the Coachella Valley. The San Andreas fault begins here, near Bombay Beach, before progressing 800 miles to the north. Research in 2016 revealed another fault underneath the sea, termed the Salton Trough fault, running parallel to the San Andreas fault. The geologic character of the area has created numerous mud pots and mud volcanoes locally. Continued filling of the Salton Sink was finally halted in 1907, when a line of protective levees was built by boxcars dumping boulders into the breach from Southern Pacific tracks. By then, this inland lake was about 40 miles long and 13 miles wide, covering an area of about 400 square miles. The Salton Sea is currently 35 miles by 15 miles and can be as large as 40 miles by almost 20 miles in particularly wet years. It has an average depth of 29.9 feet and, at its deepest, is 51 feet. It contains 7.3 million acre feet of water and evaporates 1.3 million acre feet each year. There is a five-mile-long trench on the south end of the Sea that is 51 feet deep. The Sea is currently 228 feet below sea level. Interestingly, the bed of the Salton Sea is only five feet higher than the lowest spot in Death Valley. After the initial fill of the Salton Sea, its water level was supported by irrigation runoff as farming in the Imperial County took hold. The agricultural runoff that sustained the lake contained not only fertilizer and pesticides, but high quantities of salt. Over the years, the salinity rose enough to kill off most of the lake’s fish species, even the salt water fish. Its salinity measures slightly higher than that of the Pacific Ocean. The current salt level of the Sea is in the area of 43 to 45 TH PPM. The Pacific Ocean is about 34.9 TH PPM. As the concentrated salt level of the Sea increases to over 44 TH PPM., it is expected that all the fish, except the tilapia, will cease to reproduce. Tilapia, an African freshwater fish originally introduced into the canal system to control algae growth, can survive up to 60 TH PPM. The Salton Sea is so flat and shallow that a vertical foot of drop can expose thousands of feet of dry lake bed. As the playa is exposed, it dries quickly in the desert heat and sun. The winds kick up the dust, creating a serious air pollution problem. The flow of water into the lake is now greatly reduced, causing salinity to spike; eventually, even the hardy tilapia fish will die off, the birds that feed on them will either migrate or die off themselves, and the dust will only get worse. The nonprofit Pacific Institute estimates that without intervention, the surface area of the 350-square-mile lake will shrink 100 square miles by 2030, the salinity will triple over 15 years, and the fish will disappear in seven years. San Diego's water purchases from Imperial Valley -- which ramp up to 2021 -- are to blame, but low rainfall and water conservation also hurt. Some work is being done to improve the area. The North Shore Yacht Club, long abandoned, was refurbished in 2010 and reopened as a community center. View from the North Shore Yacht Club - As of 4/19 the opening to the sea is gone. Construction is underway on the $3.5 million Red Hill Bay project. 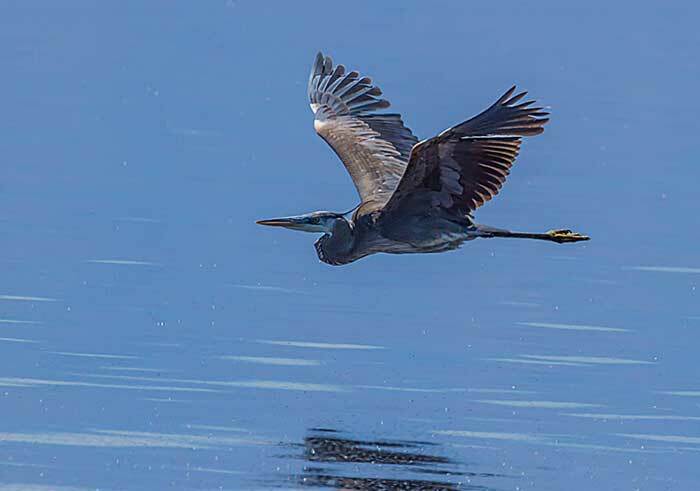 The project plans to pump and mix water from the Alamo River and the highly saline Salton Sea in two 210-acre holding ponds on the lake's southeastern shore to create bird habitat. Dedicated in 1955, the Salton Sea State Recreation Area is the largest recreation provider on the Salton Sea. Operated by the California State Park Service, it is located in the northeastern shores of the Sea. 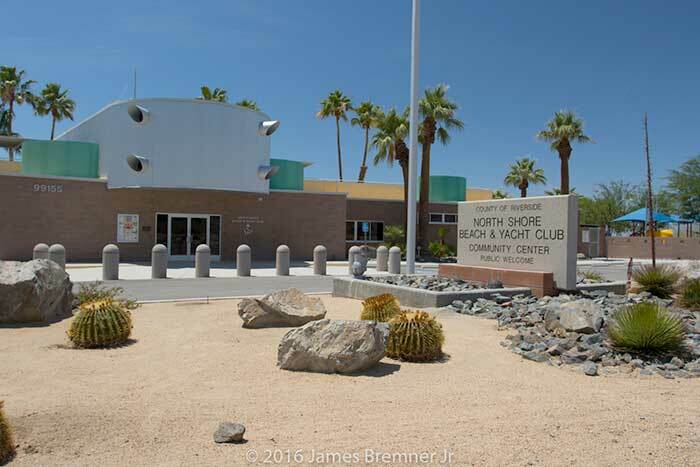 This large recreation area extends from the town of North Shore to Bombay Beach. It has 1,400 campsites, hundreds of day-use and picnic sites, trails, a Visitor Center, a playground, a boat ramp and a boat washing area. Over 100,000 people visit the popular recreation area each year. Popular activities at the Salton Sea State Recreation Area include boating, water-skiing, fishing, jet-skiing, hiking, birdwatching, and sailboarding. It is estimated that over one million visitors spend time at the Salton Sea each year. Neighboring attractions include the Palm Springs Resort area, 30 miles north, the General Patton Museum, 40 miles northeast and the Dos Palmas Preserve and historical area just to the east of the park. Stores and gas stations area available in North Shore. Varner Harbor, at the park's headquarters, offers a fishing jetty where many fish are caught. Tilapia, a perch-like fish, are being caught by the hundreds. A day of fishing may net over one hundred fish. There is no limit to the number of tilapia that can be caught. Other sport fish include corvina, presently caught with a fair degree of success at the south end of the Sea. Croaker are being taken at the north end, but not in great number. A few sargo have been seen. Also found in very rare instances are mullet and striped bass. The Varner Harbor was deepened in 2016 by dredging. The channel is between 4 and 6 feet deep is open to recreational boaters as a boat launch for a small fee. The Sea and Desert Visitor Center, located at the park's headquarters, offers examples of the many birds and animals that are present around the Salton Sea. Video presentations demonstrate how the Sea was created and its human history. The State Park Rangers offer a variety of interpretive presentations, including lecture series, campfire programs, Jr. Ranger programs and bird watching trips aboard the park's interpretive boat. A boat ramp gives boaters access to almost 400 square miles of lake surface. As of 4/19 Varner Harbor is closed to vessel access until further notice. 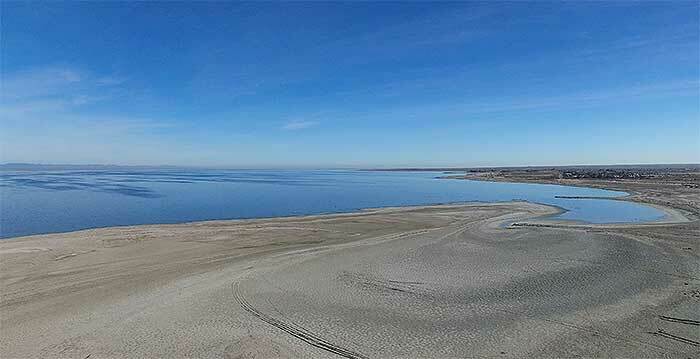 The Department of Parks and Recreation is meeting to determine the best course of action with regard to the decreasing water level of the Salton Sea and recreational boating access. At this time, you may access the Sea by wheeling or carrying your non-motorized vessel (or motorized, depending on how heavy it is) across the beach directly to the water. At this time we know of no other motorized access to the water on the Salton Sea. At no time are visitors permitted to drive vehicles on the beach in the Salton Sea State Recreation Area. Bird watching is very good at the park, as it is all over the Salton Sea. Migrating birds begin to be seen on the Sea as early as October. They fill the air by January and generally leave by May. With the sea at low level soon the birds will no longer stop here, because there will be no food for them. The local have begin to notice fewer birds are coming back each year. Some of the bird are now not getting enough food to continue their migration and die here. The park has over 1,400 campsites in five campgrounds. Three campgrounds are primitive, two are developed and one offers full hookups. 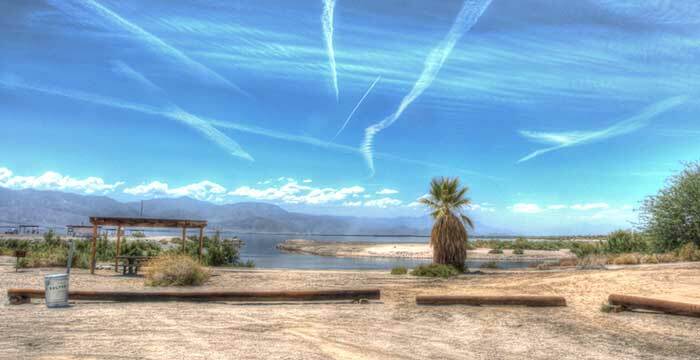 Camping at the Salton Sea State Recreation Area is best from October through May. The park is open all year, but summer temperatures can be extreme. Reservations are not taken for the primitive campgrounds, but they should be obtained for the hookup area. Headquarters Area: This is the main part of the park; two campgrounds offer different types of services. Due to budget constraints Bombay Beach and the upper loop of Mecca Beach are closed until further notice. Camping at Headquarters Camp, the lower loop of Mecca Beach, Salt Creek, and Corvina Beach is available. New Camp is developed with flush toilets and showers. It provides easy access to hiking trails, a fishing jetty, the park's main boat ramp, sanitary stations, and boat wash stations. Located nearby are the park's Visitor Center and a small playground. Also at Headquarters is the Hook-up section. These hook-ups are close to the recreation area's headquarters office and have nearby restrooms and showers. They are located in front of the park's largest beach where many activities take place. Non-hookup group camping for hundreds of RVs is available at this location. There is also a sheltered meeting area for groups. 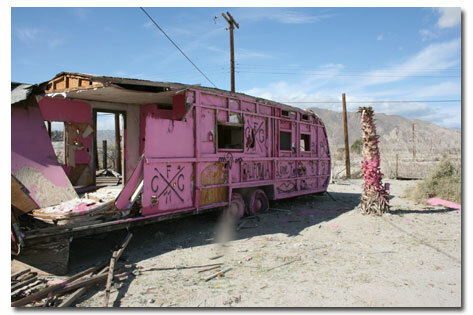 Bombay Beach is located at the extreme southern end of the recreation area, next to the small town of Bombay Beach. It's now closed. It had offered beach camping with chemical toilets and water and used to be a popular campground for fishermen. Some services are available in the adjacent town. Bombay Beach, CA is a point of interest for photographers and visitors who want to view and shoot the ruins of part of town that once was. Salt Creek Beach, another primitive campground, has on the beach camping, and chemical toilets. It is popular with fishermen and bird watchers. Salt Creek runs through the campground and is host to many species of birds, including some considered very rare. The endangered pupfish also live in Salt Creek. Corvina Beach is also primitive, with water and chemical toilets, and is popular with groups. While this campground is on the shores of the Sea, it has a drop off to the beach and access can be difficult. However, many winter fishermen spend the weekends at Corvina Beach. Mecca Beach Campground is a large developed campground with good beach access. Mecca Beach has flush toilets and showers and a limited number of partial hook-up sites. Good fishing is found off of Mecca Beach and many swimmers and boaters enjoy the easy access to the water. Mecca Beach Campground is one of the more active areas in the recreation area.